Paul: Garlic don’t work boys. Edgar Frog: Then try it with holy water deadbreath! One of the Coreys moves into fictional Santa Carla, California, which he soon learns has a vampire infestation. When his brother goes half vampire, Corey teams up with Corey and some other kid to break the curse. Lost Boys! 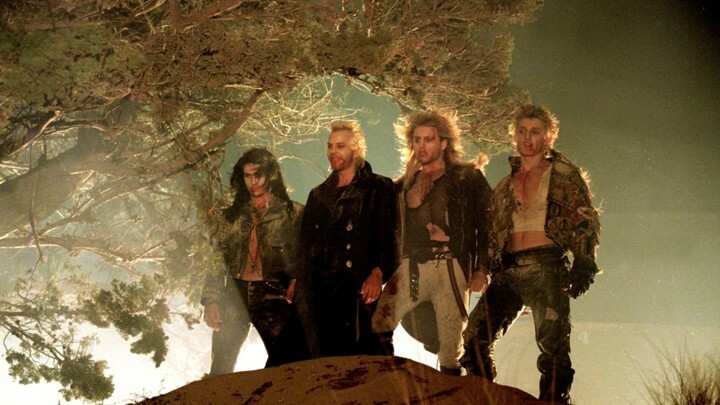 Despite my love for all things 1980’s, I’d never seen Joel Schumacher’s The Lost Boys in its entirety. Chalk up another omission to the “I saw part of it on TV one day and… eh…” category. The Lost Boys also owns the distinction of being a film directed by Joel Schumacher, who, whether he knows it or not, has become my nemesis. The feud began in 1990 (Flatliners), escalated in 1997 (Batman & Robin) and became a legitimate blood feud in 1998 (8mm) with many smaller transgressions in between. I called a truce just long enough to face my Cinema Shame and order up The Lost Boys on Netflix DVD. If I had to pick the most 80’s year of the 1980’s, I would without hesitation choose 1987. 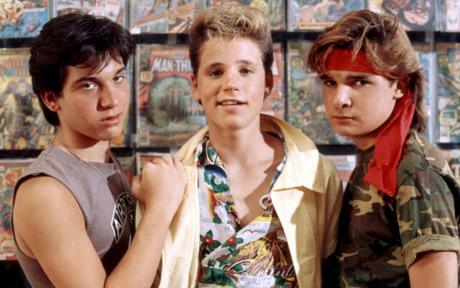 If I were to pick the most 1987 movie from the year 1987, I might just pick The Lost Boys. Joel Schumacher first worked in the fashion industry and broke into Hollywood as a costume designer. After writing a few successful screenplays he made his directorial debut on The Incredible Shrinking Woman (1981). Schumacher directs like a fashion designer with foregrounded flash and spectacle and maybe something going on behind, but maybe not. Most likely not, but that’s irrelevant because LOOK AT THE FABULOUS LAPELS ON HIS LEATHER JACKET. The Lost Boys looks and feels like a music video. A motorcycle chase scored my Lou Gramm’s (Foreigner) “Lost in the Shadows” gives the film its backbone. Elsewhere on the soundtrack find such clear-eyed aural vampire analogies like Echo and the Bunnymen’s “People are Strange” and Roger Daltrey’s version of “Don’t Let the Sun Go Down On Me.” These are not subtle cues. In turn, more narrative beats hit you through musical montage and wardrobe rather than dialogue and action. Schumacher ladles on superficial visceral thrills in place of downtime. The result is film as pop-culture. 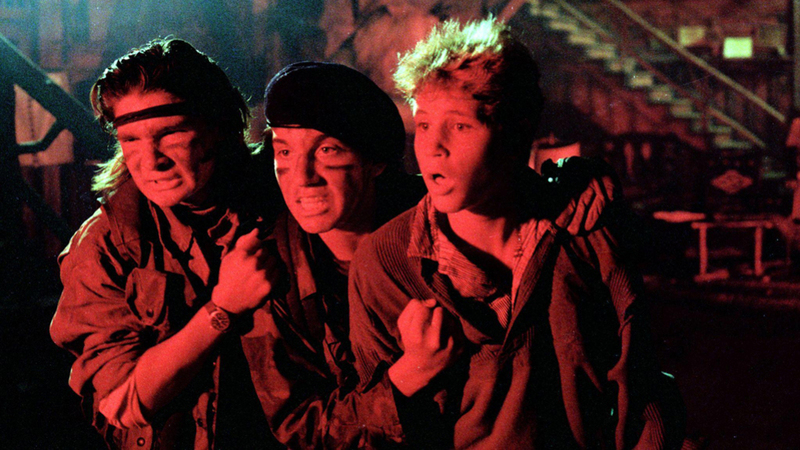 As a kinetic riff on 1987 popular culture, The Lost Boys would have felt hyper-stylized in the moment. Removed from the era of its manufacture, the film now feels reflective of our late 80’s nostalgia. This is how we now remember 1987 — a compression of Michael Jackson’s “Bad” leather, bitchin’ power rock anthems, INXS, a little bit of neon, sunglasses, the Coreys, Hawaiian shirts as a fashion statement. 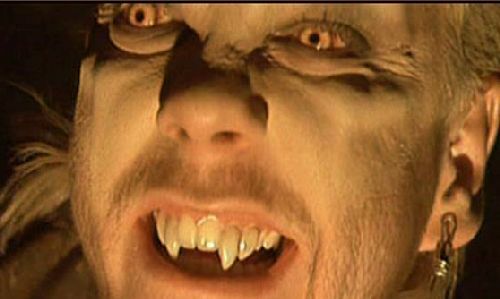 Even the vampire mythology feels rooted in 1987. Pre-Anne Rice and Bram Stoker’s Dracula. None of these things prevents The Lost Boys from being a good movie. On the contrary, these jolts of processed pop culture nostalgia seem to have some of the most adamant fans. They stand out precisely for the reasons highlighted above. Due to my pre-disposed negativity for Joel Schumacher I watched The Lost Boys and yelled BINGO! after seeing all my favorite Joel Schumacher flourishes grace the screen before the half-hour mark. As a director, Schumacher’s a magician, a practitioner of misdirection, and The Lost Boys probably remains his crowning achievement. But instead of smoke and mirrors, he’s using rock anthems and Kiefer Sutherland. 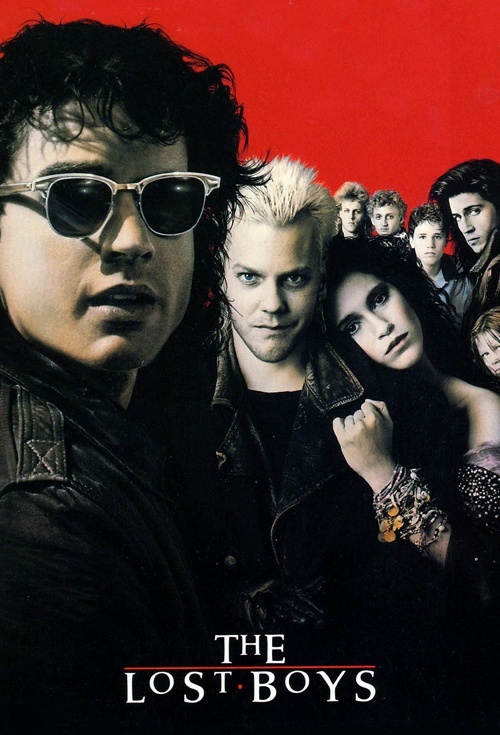 If you loved The Lost Boys back in 1987, I’d wager that you’re still very much attached to the film. As a lover of all things 80’s, I understand the allure completely; it hits you like a 10-ton blob of hair gel. Having viewed this film for the first time as a 40-year old manchild, the tone’s far more childish than I’d anticipated. 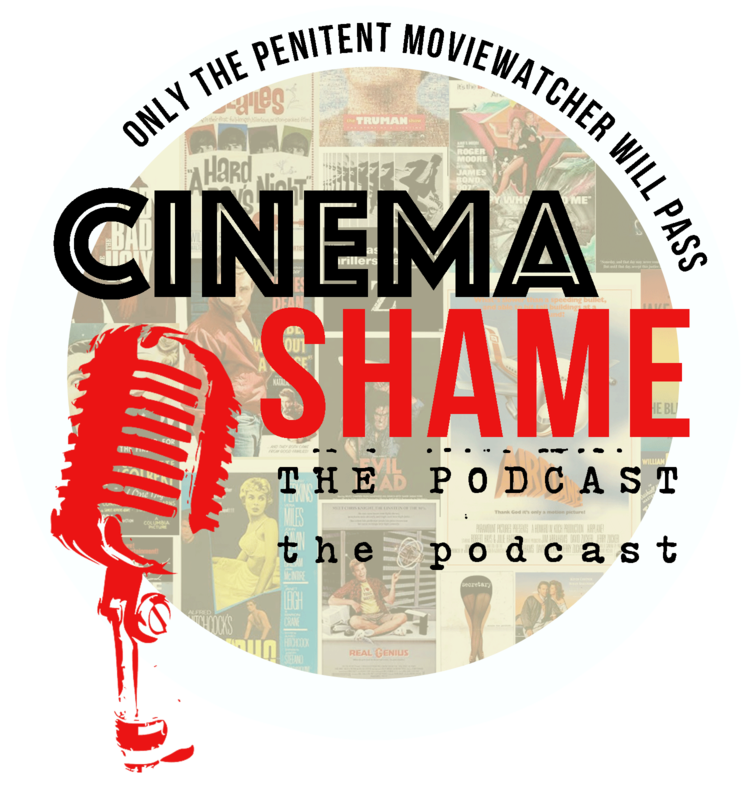 Safe scares for prepubuscent horror-fans-in-training with Jason Patric as your James Dean rebelling with a cause, an excellent cause by the name 1987’s Jami Gertz. Light on vampire gore, but high on humor, mild tension and beautiful people. 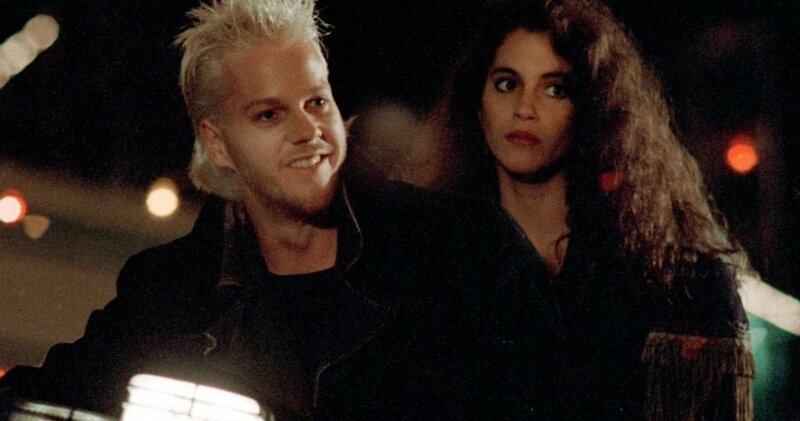 There are worse reason to love a movie — but understand that presentation in The Lost Boys is everything and if you peek behind the gloss, it’s mostly undead.